No? Well, with my tips below, you will be singing in no time. Just because you aren’t in school doesn’t mean it isn’t your school year, too. 1) All the back-to-school supplies are on sale now. 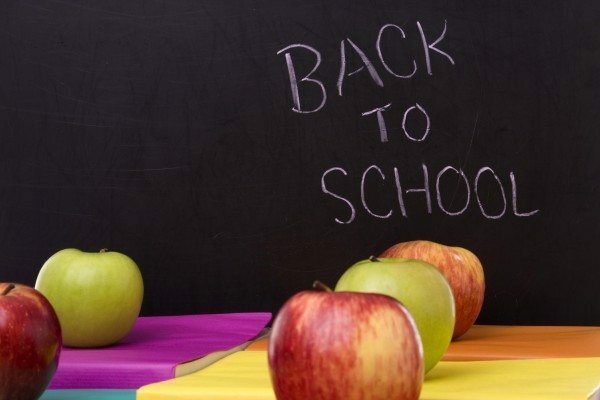 I’m sure most of you have bought the supplies your kids need from their school lists, but don’t forget to stock up for your home as well. My children are notorious for not telling me about school projects until late Sunday afternoon, when I end up scrambling around trying to buy poster board and glue. Now I use the extra hours to yell about not waiting until the last minute to do projects. It’s a much better use of my time. 2) Don’t forget to buy yourself some things, too. Some nice notecards and pens. Hide these things from your kids, however, because despite all of the supplies you just bought them they will want yours. 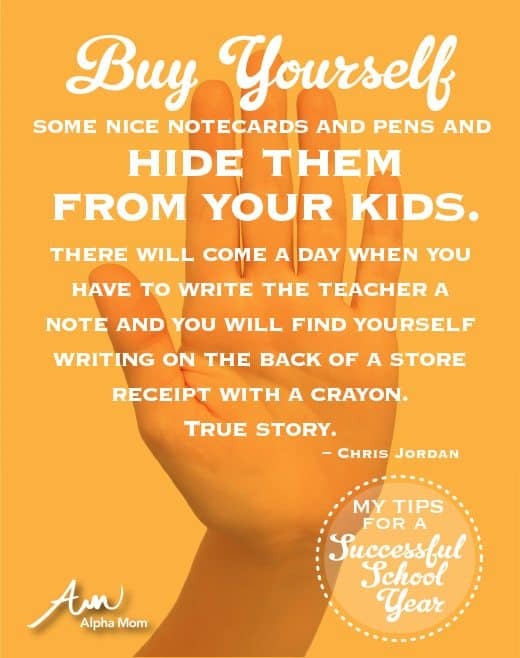 And there will come a day when you have to write one of their teachers a note and you will find yourself writing on the back of a store receipt with a crayon. True story. 3) Set aside time for homework every day. I find it easiest to make my children do their homework right after school. They have a snack and start right in. Then they can play with their friends or go to after school activities without it hanging over their heads. Or I should say my head, because my children don’t really seem to care if they do their homework or not. According to all my friends, homework time is their least favorite time of the day also. Their suggestions for making it go more smoothly include a cattle prod, vodka, and earplugs. Do with that information what you will. 4) Plan your dinner menu in advance. So you always have the ingredients on hand and don’t have to run out to the grocery store at the last minute. Also plan that the most reviled meals coincide with your favorite TV shows. “If you refuse to eat your dinner of brussel sprouts and liver smothered with onions you will go to bed early tonight!” Then you settle onto the couch and watch The Real Housewives, with your friends, Ben and Jerry. No one said you have to eat the food you cook. 5) Pick out clothes the night before. There is nothing worse than arguing with a crabby child over their outfit of choice before the sun has even risen. Then when they fall asleep you can swap out the items that you wish would get lost. They hardly ever notice the next morning. And if they do just pretend you have no idea what they are talking about. 6) I know. You are wondering about how to lose clothes. The unforeseen bonus to this? Your children will hate to have their clothes washed. Less laundry for you, more time to charge the cattle prod. We have been back to school for three weeks. I have to say it is going splendidly. What are your true-and-tried tips? Spill ’em. 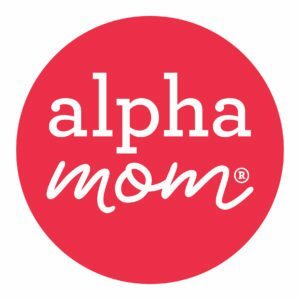 Chris Jordan began blogging at Notes From the Trenches in 2004 where she wrote about her life raising her children in Austin, Texas. Oh, she has seven of them. Yes, children. Yes, they are all hers. No she’s not Catholic or Mormon. Though she wouldn’t mind having a sister-wife because holy hell the laundry never stops. Yes, she finally figured out what causes it. That’s why her youngest is a teen now. Yes, she has a television. She enjoys referring to herself in the third person. Very funny, yet very true! Especially the points about getting your own supplies and keeping poster board on hand! I say “Amen!” to the school uniform…..what to wear is only an issue on picture day. I just bought a 10-pack of poster board last night. There is nothing worse than dragging 4 kids to the store for poster board. Okay, there’s probably worse things, but it’s definitely up there.